Silks	Register for a Silks Class now! Have you taken Silks Intro before? Are you familiar with all the skills taught in Silks Intro but still need more strength to meet the Silks 1 prerequisites? Are you familiar and comfortable spotting and being spotted? Do you like working hard, pushing yourself and being pushed by the instructor? Then this class is for you! All the same skills you know from Silks Intro will be taught but with less explaining, fewer breaks, more reps, and more POWER! Designed to help you bump your strength to the next level, this action packed class is fun and empowering. Come prepared to work hard and have fun! Must have taken minimum of 6 weeks of Silks Intro and Strength building. Familiarity with Silks Intro and Strength Building Curriculum. 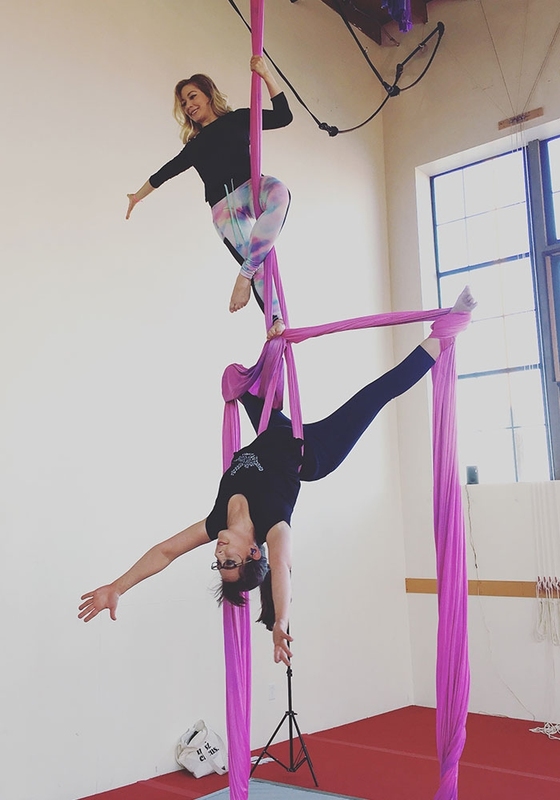 This class is a fun, beginner friendly introduction to Aerial fabric or "Silks" which is a very strong fabric that we climb on. If you are excited about climbing, wrapping, and playing in the air while supported by a fabric, this is the class for you! There are no prerequisites to take this class and it is designed to help you build a solid foundation in aerial strength and technique. This takes time, however, so students should expect to take this class multiple times before being ready to take Silks 1. 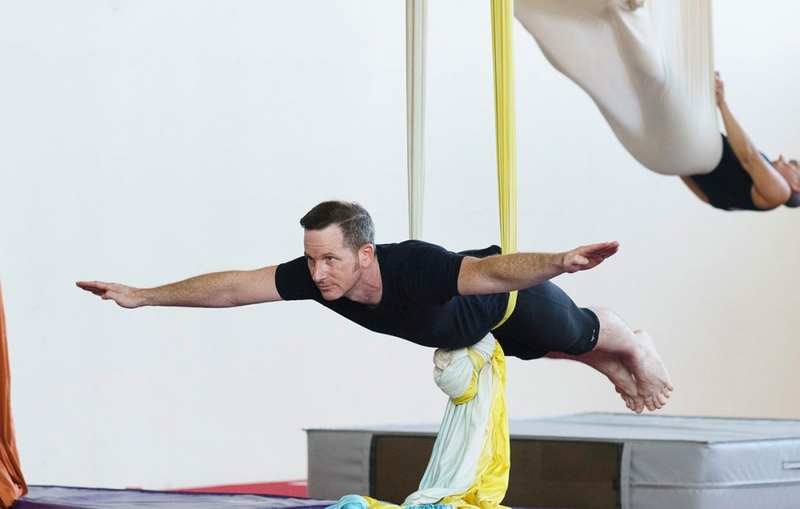 With each time they repeat the Silks Intro class, instructors will keep continuing students challenged by giving more variations and help mastering what they have learned. Be patient and enjoy the process! Come prepared to work hard, and have fun! In this class, students will begin low to the ground and work their way higher as they build strength, stamina, and familiarity with basic climbs, wraps, and body positions. Students can expect to learn skills like leg lock and play with sequences from figure 8 footlocks like Rebecca Split sequence as well as learning multiple ways of getting into double foot knots. Students should expect to repeat this 6 week class several times before they will be ready to take Silks 2. Coaches will keep continuing students challenged by giving them opportunity to work towards mastery of skills they already know as well as harder variations when appropriate. Come prepared to work hard, have fun, and enjoy the process! Must have taken a minimum of 6 weeks of Silks 1. Familiarity with all things in silks 1 curriculum. In this class we will learn new ways to get into crossback straddle while working on the core strength you need to meet the prerequisites for level 3 silks. Come play with us and learn new tricks and transitions! Familiarity with all things in silks 2 curriculum. In this exciting class, students will increase their strength and stamina as they work higher, stay in the air longer, and learn skills like Leg Lock, Seat twist into crossback straddle, and Cartwheel into Belay. There is more packed into level 2 silks than anyone could master in 6 weeks so students should expect to hang out (pun intended ;-) in this level for a while before being ready to move up to level 3. Come prepared to have fun and be challenged in a supportive environment! Must be able to invert in a straddle FROM THE AIR (fabrics together AND apart) without help. Perfect form not necessary. In this exciting class, students will increase their strength and stamina as they work higher, stay in the air longer, and learn skills like Leg Lock sequence, Beaman Sit twist into crossback straddle, and Cartwheel into Belay as well as working towards Silks 3 material like same Side Stand Up, catchers hang sequence new climbs First Drops and more! Come prepared to have fun and be challenged in a supportive environment! In this class students will learn their First Drops! We will also work on sequences like Same Side Stand Up and Catchers Hang sequence as well as Double Ankle Hang and new climbs like Big Russian and Sous Sous climb. Students should come prepared to stretch their adrenaline muscle while working hard and having fun! In this class, students will work on skills such as hipkey, Big L, Trapeze drop, Skater, Crochet climb and more! Strength, stamina, and good form will be a focus in this class. Come prepared to work hard and have fun. An emphasis will also be placed on fabric theory and understanding "what's holding you up?" Be prepared to hang out in this class for a while before being ready to move up to level 5. In this class we will be learning new climbs and a veriety of wheeldowns including split tissue and single leg wheeldowns and beat work to begin putting on wraps. Intermediate Silks: Intermediate Silks Split Tissu Brigade DROPS! Trapeze	Register for a Trapeze Class now! Static Trapeze is a steel bar suspended by a thick rope on each side that kind of looks like a swing. In this super fun beginner friendly class students will learn basic trapeze skills and build strength, stamina, and technique. Students will be encouraged to work at their own pace and coaches will work with them where they are at. No prerequisites. Come prepared to work hard and have fun in a unique and supportive environment. In this class we will introduce new and exciting trapeze skills and the necessary strength and technique building drills to accomplish them. Students should expect to take this class multiple times before being ready to take Trapeze 2. Instructors will keep continuing students challenged by offering harder variations and help mastering things they already know throughout class. Check out the prereqs and talk to your coach to see if this class is right for you. For students who have mastered the most if not all skills taught in Trapeze 1 class, met the prerequisites, and received instructor permission, come join us in Trapeze 2! Students will begin learning rope skills, combinations, and staying up in the air longer. Students can expect to learn skills such as seahorse, front balance, straddle back balance, forward roll, and ankle hang. Students should expect to repeat this level several times since it takes a while to master these skills and 6 weeks is barely enough time to introduce them all. Coaches will keep continuing students challenged by giving harder drills and guidance with mastering the skills they already know. This class is for students who have mastered most if not all Trapeze 2 skills and have instructor permission and meet the prerequisites. Level 3 dives into more complicated wraps, rolls, and swings, and introduces some basic strength moves. Some skills that we will work on in this class include: 1 knee roll up, crows nest, wrapped angel, and shoulder stand. Come prepared to work hard and have fun! For level 3 trapeze folks who do not yet meet the prerequisites for Trapeze 4 but are quite familiar with Trapeze 3 skills and want to work hard, push themselves, and be challenged. This Intermediate level class will work on experimentation, improvisation, and creative transitions as well as straight arm work and more difficult moves. Instructor permission required. As always, come prepared to work hard and have fun! Rope	Register for a Rope Class now! Want to learn the basics of Rope? This class is for you! No prerequisites! Come learn foundational aerial technique and build strength, agility, and coordination in a really fun and exciting way! This takes time, however, so students should expect to take this class several times before being ready to take Rope 1. Come prepared to work hard and have fun in a supportive environment! Corde Lisse is a long, thick, rope that just begs to be climbed, swung, and played on! In this class you will learn a variety of climbs and wraps while staying close to the ground. We will cover skills such as Crucifix, Leg lock, Footlock to Arabesque, front balance, and more. Time will also be spent working on dynamic moves like beats and bounding. Students are encouraged to wear layers including a tight fitting under layer on thighs and waist and thicker layers on top for their own comfort and protection. Come prepared to work hard and have fun! Must be able to classic climb to the top, and inchworm down with good form. Must be able to invert without help and hold 3 seconds. Perfect form not necessary. Must have a 10 second bent arm hollow hang. We will be working on skills like leg lock, hip key, catchers hang sequence, back balance, front balance, and same side stand up to name a few! In Rope 2 we will learn Double ankle hang, Catchers sequence, Fankick to hip key, Same side stand up and much more. We will also begin to work on more dynamic tricks such as beat to front balance. In this class we will be working on skills like Wheel downs, Two Knee Hangs, Same Side Stand Up, Bug climb, Straddle climb from an opp. side hook and from Center hook, and S wrap dive just a name a few! In Rope 3 students will dive into momentum and swinging work including scissor beats, as well as skills like s-wraps, S-wrap Dives, wheel downs, One Legged Back Dive AkA Nivek, and cartwheel AKA bullwhip. Students will also be guided in the process of gaining a better understanding and recognition of the wraps they are in and what makes them safe. As always, come prepared to work hard and have fun! In this class, students will continue to be challenged and inspired by the incredible adventure that is Aerial rope. Students must have permission of the instructor to participate in this class and can expect to work on creative sequences to build flow and endurance as well as skills like Jukka Bubble, trout, beat sequences and more! As always, come prepared to work hard and have fun! In this class we will be exploring Salto variations like the Ginger salto and the Terry Crane entrance into Salto. we will continue to work Rolls like the hipkey roll up and one arm preps and hangs. Come prepared to work hard and have fun! We will be exploring transitions and learning new things together on the rope! Come prepared to be challenged by the rope in your brain and body! In this class we will explore the full expression of the three beat pathways- Bell, Turn-pike and Scissor as well as C-shaping rolls. We will also begin working on release moves from beat pathways. Come prepared to work hard and build your dynamic stamina! Hoop	Register for a Hoop Class now! In Hoop 1 student will add to skills they learned in Intro. Students can expect to learn new skills, mounts, dismounts, and transitions while getting stronger and also having the option to incorporate spinning in more ways. Students will also be encouraged to experiment and explore on the Hoop. Come prepared to work hard and have fun! In Hoop 2, students will work on more challenging concepts and techniques while learning new skills and sequences. This class is for students with instructor permission who have mastered most or all of the skills taught in Hoop 1. Check out the prerequisites and talk to your instructor to see if this class is right for you! Come prepared to work hard and have fun! In hoop 3 students will begin working on more challenging concepts and techniques and applying them to new moves and sequences. Students can expect to learn some skills that require a little more strength and precision as well as help building stamina and creativity. Instructor permission required. Check out the prerequisites and talk to your instructor to see if this class is right for you! Come prepared to work hard and have fun! In this class we will be working on material from level 3 and 4 including skills above the bar and in the span set. Come ready to beat, swing and move through the Hoop as we play our way into graceful movement. Extend half way into shoulder extension and return with good form (above bar). Roll up and down from hip hang with bar touches with control. Inside knee hook on span set, slide to cradle both sides. 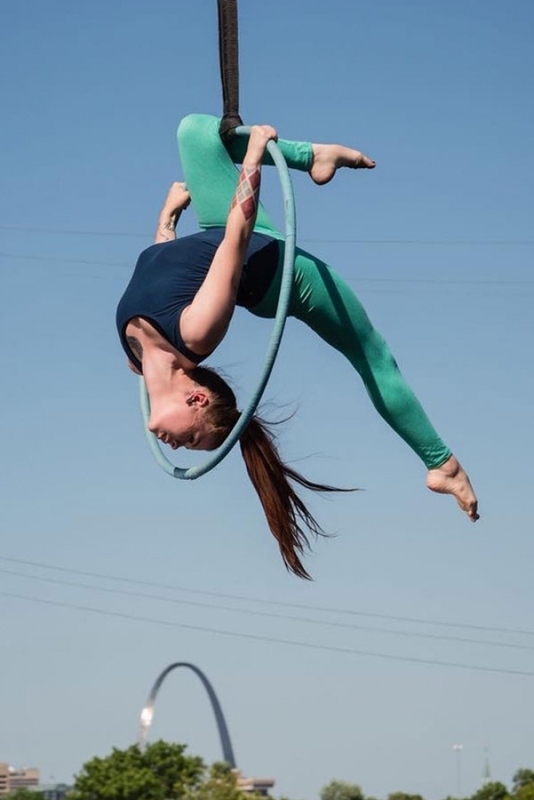 3 connected tuck inversions on top of hoop. 1 Knee hang with Rounde jambe both sides. Single hip hang, transition to other single hip hang both ways. Sit, roll to hips 1 handed both directions. Slings	Register for a Slings Class now! Explore new shapes, drops and rotations on sling to create this performance piece. Come play in the air while supported by aerial sling! The aerial sling is a beautiful form of suspended movement made of fabric hung in a loop or "hammock" attached at the same hang point. In this class, students will be guided through some basic aerial skills on the sling as well as ways to use the sling for stretching and strengthening exercises. Come prepared to have fun and try something new! Mastery of most if not all level 2 skills. Straddle up from ground with straight legs and good form. Straddle up from the air with good form. Superman drop and full gator sequence both sides. Marionette rolls forward and backward with control. Gator flow with control both sides. 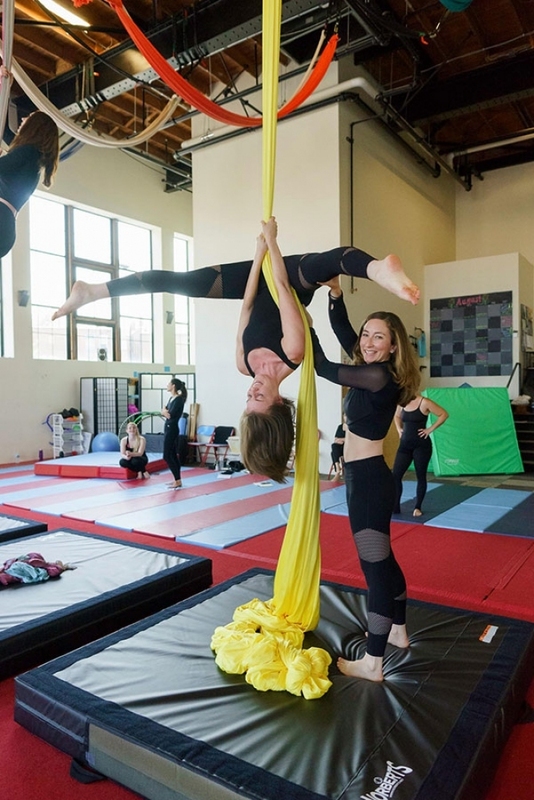 Aerial Fitness	Register for a Aerial Fitness Class now! Fight off the boredom of routine with us in this unique and upbeat class! 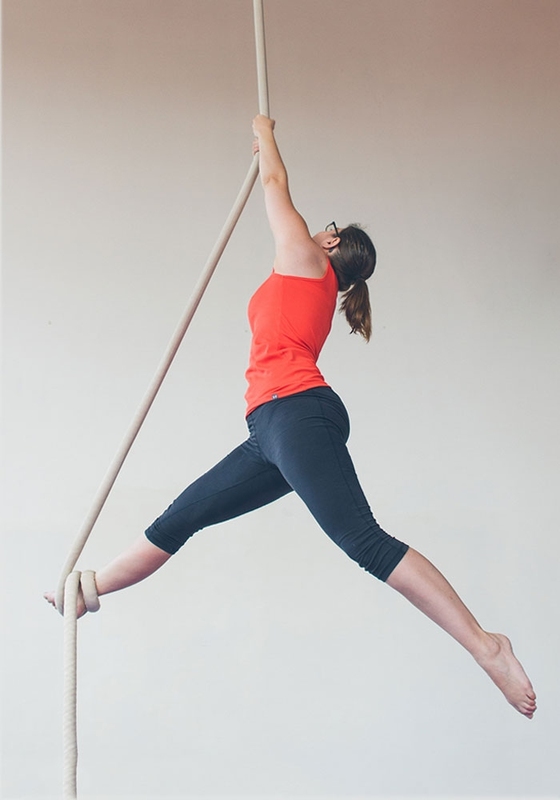 By supporting and manipulating your own body on our Trapeze Bars, Ropes, and Fabrics, you will find that fitness can be new and fun again! Burn calories, gain flexibility, build muscle, and develop increased stamina in a creative and supportive environment. Students should be prepared to work hard, have fun, get stronger, and make friends while doing it! This is a more advanced version of our ever popular Aerial Fitness class. 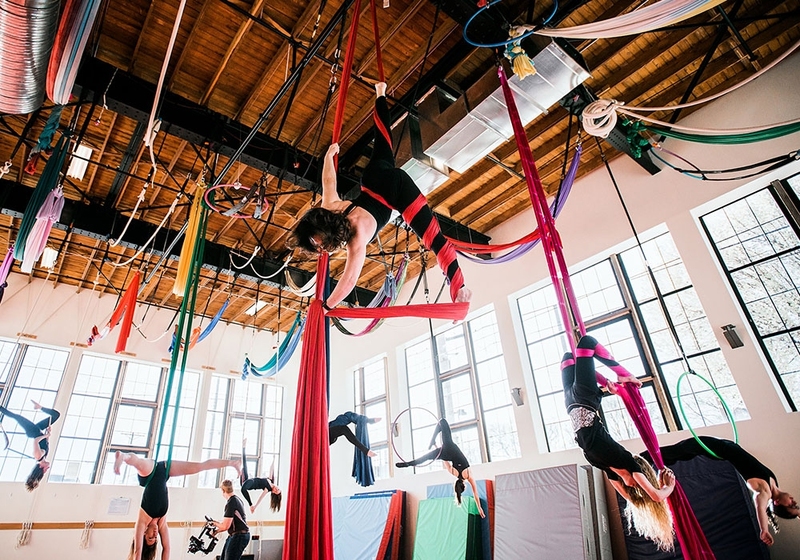 In this class you can expect to get an intense workout for your upper body, abs, and lower body using the aerial silks, trapeze, and rope. Come prepared for a fun and engaging workout! Must be level 2 or higher in at least 1 apparatus. Straddles	Register for a Straddles Class now! Take your straddle inversions to the next level in this exciting inversion focused, action packed, conditioning class! Whether you are struggling to get your straddle from the ground, from the air, or just wanting a fabulous workout to improve your already strong straddle, this class is for you! 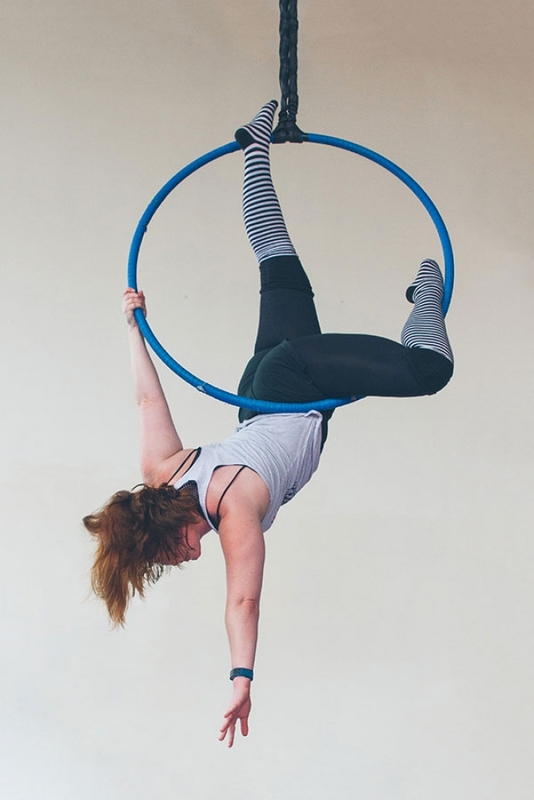 This class is especially helpful for students in Silks Intro, Silks 1, Intro to Hoop, Hoop 1, Intro to Trapeze, and Trapeze 1 who are working towards the next level. This class is also open for drop ins and as makeups for students who have already taken a 6 week intro class or have been approved by their instructor. 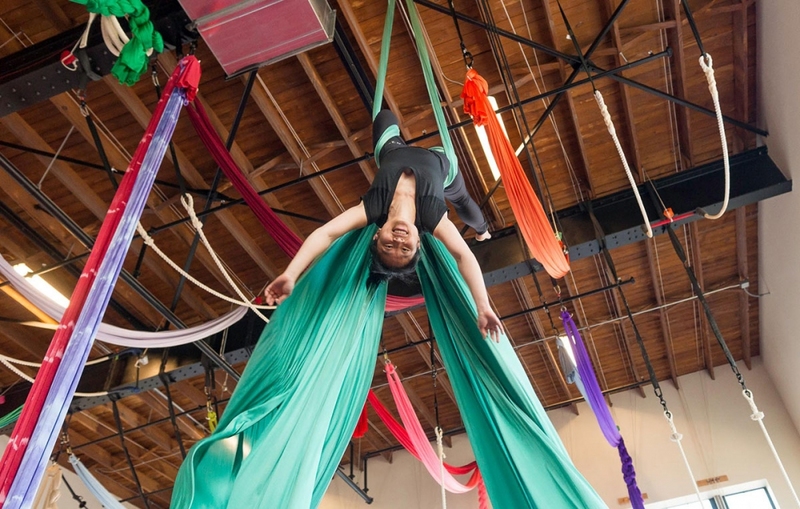 Must have taken at least 6 weeks of Silks intro and strength building, Aerial Fitness, Sings Intro, or another beginner level class OR have instructor permission. Mixed	Register for a Mixed Class now! 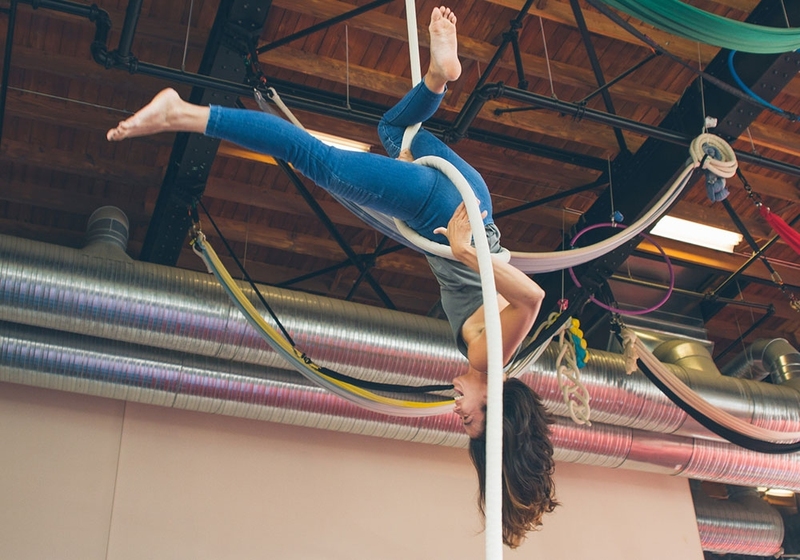 Aerial fabrics are a beautiful aerial apparatus that consists of two pieces of strong fabric that are hung together on a swivel and used to make beautiful shapes and poses. Corde Lisse is a long, thick, rope that just begs to be climbed, swung, and played on! 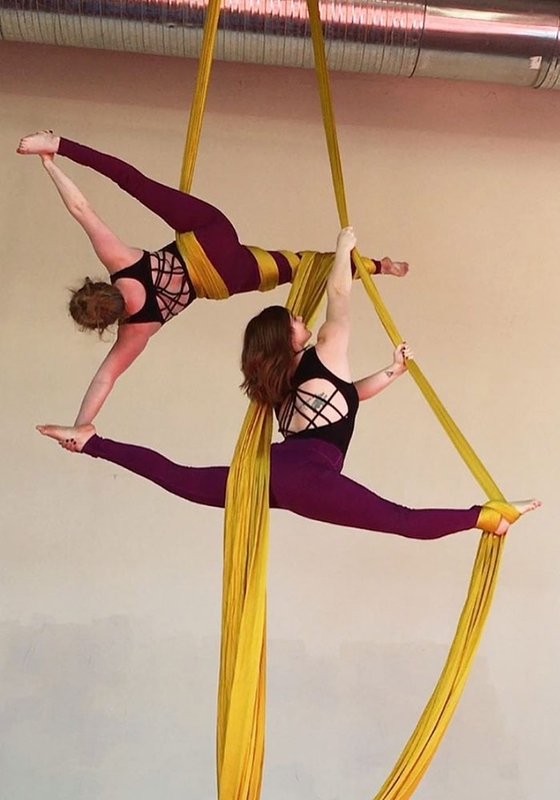 This class is a fun, beginner friendly introduction to Aerial fabric or "Silks" and Corde Lisse or "Rope." There are no prerequisites to take this class and it is designed to help you build strength and technique and learn how they differ on these two apparatus. Come prepared to work hard and have fun trying something new! Come compare and contrast Vertical Rope and Silks! We will explore how these two apparatuses compliment and differ from each other while learning beats, swings and sequences on both fabric and rope! In this class we will be building on skills from level one like Rebecca Split Sequence and Leg Lock and adding new skills like Belay! We will continue to work on the fundamentals of pathways in beats both on the ground and in the air! Students should come prepared to work hard and have fun in the process! Must be able to invert in a straddle from the ground with fabrics apart and together and hold 3 seconds at the top. execute Rebecca Split Sequence with good form on both sides & give verbal explanation. Come work on a performance piece with Alyson for the 2019 Showcase! This will be a mixed apparatus class. Apparatuses used will be dependent on class make up and act development. Come ready to have fun and be apart of a great Showcase act! We will be working on Rope and Silks exploring sequences of tricks, drops and beats! This class will consist of longer sequences on both the Fabric and the Rope. We will also focus on momentum to create a more effortless feel and quality of movement within tricks. Come ready to build both vocabulary of tricks and stamina in sequences. Learn ways to climb underneath on and above a partner on silks and rope. We will explore multiple ways to mount and find poses and clever positions as well as wraps to safely base weight from. In this class we will be exploring and learning longer choreography on fabric and rope. You will come away with two sequences long enough to use as a complete act. Both sequences will keep your body and brain in good good shape! 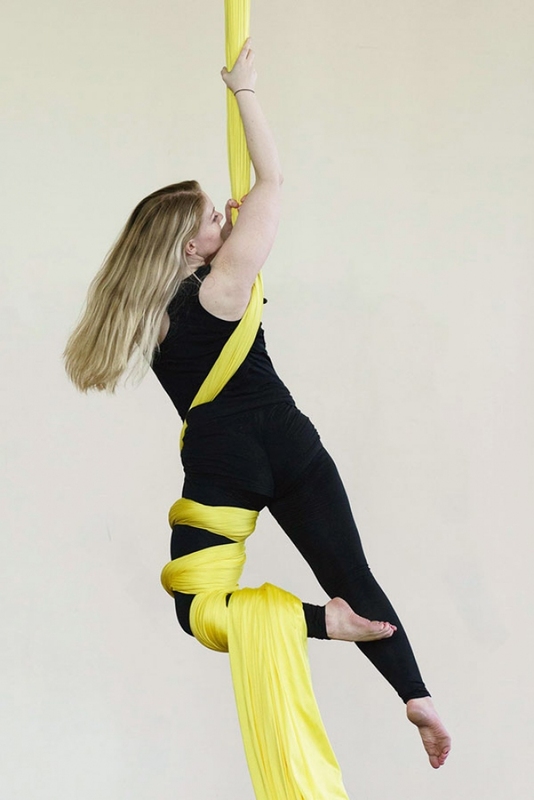 We will explore wraps and drops on both Rope and Silks and explore how to safely change and sequence them. Theory	Register for a Theory Class now! Did you know that a hipkey is the same as a Russia climb but on another part of your body? Do you know how to put on a leglock without inverting? Delve into to the intricacies of what's actually happening with those wraps your body knows how to make but your mind doesn't...yet! Youth Classes	Register for a Youth Classes Class now! This class is for students who are familiar with all the Intro Tween Aerial material and are looking at refining their skills to move on to level 1 Tween Aerial. Is your child part monkey? Do they love being upside down? Then this class is perfect for them! Kids will develop body awareness, focus, and perseverance in this fun and non-competitive class. Students will be taught trapeze, rope, silks, and much much more! This class can accommodate ages 5-8 Sign your little monkey up today! 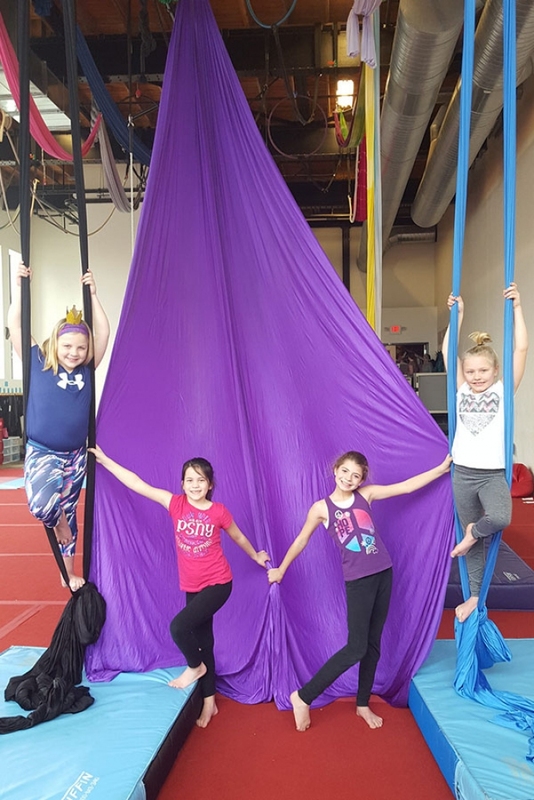 This class is designed to give kids ages 9-12 an aerial experience in a fun and supportive environment that the circus community loves to provide! Learn the basics of climbing, foot knots and conditioning. This class introduces Tween bodies and minds to the building blocks of shapes and strength they will need to progress in aerial arts. In this class students will begin to work on level 1 skills in Trap, Silks, and Slings. Students can also look forward to conditioning to take skills like straddles and foot knots to the air! Tweens Aerial Choreography is for ages 8-11 working towards a performance. Kids will work on skills and tricks on Silks that will culminate a group act to be performed on April 6th at the Spring Community Show! Kids must be available to perform on April 6th to take this class. 6 week session of Tween Power or Tween 1. Building on skills the student learned in Tweens intro this class will use multiple apparatuses to explore aerial arts. Come ready to learn tricks and transitions with a focus on form. As always we will condition throughout class to build endurance and mental toughness.